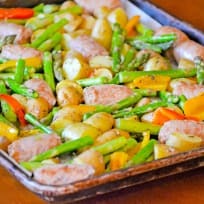 Sausage, potatoes and asparagus get roasted on a baking pan for an easy supper with very little clean up. 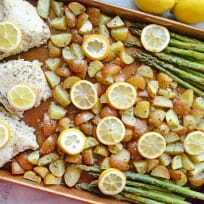 What’s not to like about a sheet pan dinner? Roasted spring vegetables with butternut squash noodles are a colorful recipe no one could resist! 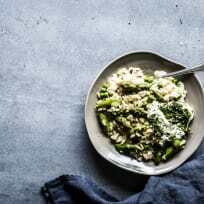 The best flavors of spring and winter in a naturally gluten-free ‘pasta’ dish. Meyer lemon kale pasta makes a happy dinner any night of the week. It’s bright and earthy at the same time, and filling too. These ham asparagus scones make an excellent savory addition to the brunch table. They’re perfect for using leftover ham! This asparagus prosciutto pasta is sure to be a new family favorite. All you need is one pot, and dinner is done! An asparagus tart with bacon may just be the best way to start your Sunday morning. 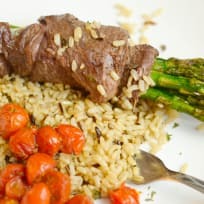 Celebrate spring with this delicious seasonal recipe! Katie's sun-dried tomato chicken skillet is a one pot meal that can't be beat. Dinner on the table, in less than 30 minutes! Chicken and shrimp curry that’s easy to make and easy to eat. Delicious for two, or double it – because you’ll definitely want leftovers.